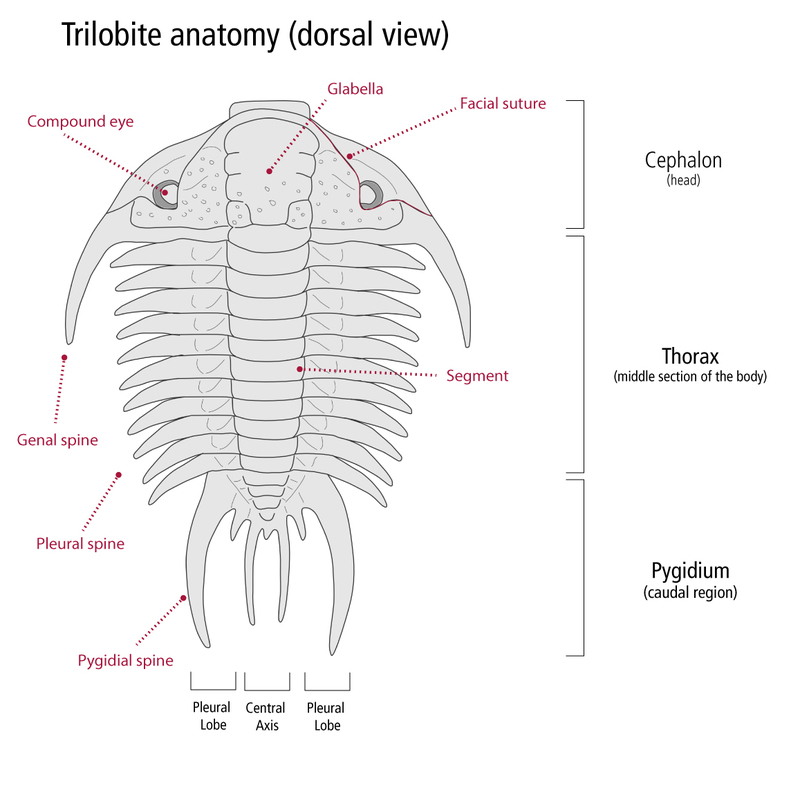 Trilobites are a group of extinct marine arthropods that first appeared around 521 million years ago, shortly after the beginning of the Cambrian period, living through the majority of the Palaeozoic Era, for nearly 300 million years. They died out at the end of the Permian, 251 million years ago, killed by the end Permian mass extinction event that removed over 90% of all species on Earth. They were very diverse for much of the Palaeozoic, and today trilobite fossils are found all over the world. Some burrowed in sediment, while others crawled over the sea ﬂoor or swam in open water. Some were probably detritus feeders, scavengers or predators. Other modes of life, such as filter feeding, have also been proposed. The name 'trilobite' comes from the distinctive three-fold longitudinal division of the dorsal exoskeleton into a central axis, flanked on either side by lateral (pleural) areas. The anterior region of trilobite body is the head shield, or cephalon, which is made up of a series of fused segments. This commonly bears large, crescent-shaped compound eyes on the upper surface, which are thought to have had an incredible depth of field. On the cephalon of many trilobite species there are also lines called 'facial sutures', marking the lines along which the carapace split when the animal moulted. The lower surface of the cephalon bore a calcified plate called the 'hypostome' which covered the oesophagus and mouth. There may also be a second plate, called the 'rostrum', in front of the hypostome. A single pair of uniramouse antennae is normally followed by three pairs of two-branched ('biramous') appendages on the cephalon. The thorax is made up of a series of segments, each with a single pair of biramous appendages. The segments articulated with each other, and trilobites could roll up into a ball similar to present-day woodlice. At the posterior end of the body, the pygidium is made up of a series of fused segments. Palaeontologists have identified several thousands of different species of trilobites.